I was checking out local KickStarter projects last night and this one caught my eye. I've been a fan of Little Free Library since I first heard of them and now there's an Ottawa-based KickStarter seeking to raise a measly $500 to start a Little Free Library right in our own community! 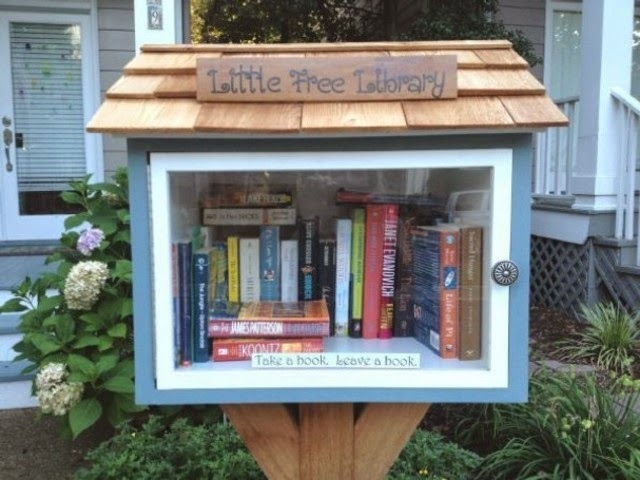 If Little Free Library is new to you, here are the basics: it's a movement to put adorable little birdhouse-type structures all over residential and urban areas to house books for giving and taking. Essentially, these little boxes are the most basic way to promote sharing information and love of reading: You put one in a public area (e.g. your front lawn), fill it with used books and people can come by to grab a new book or donate their own used books. And this Ottawa KickStarter is just looking for enough funds to install one on a lawn in Fisher Glen and fill it with books. Once the library is ready to go, any additional funds will be spent to continue filling it or possibly installing more Little Free Library houses elsewhere in Ottawa. A DIY library? I mean, come on! This is a no-brainer! Now, wouldn't it be absolutely amazing if Ottawans blew the roof off this KickStarter? And we funded it enough to build a whole BUNCH of free libraries all around Ottawa? I pledged. Why not go give them a few bucks (or more :) and help them get to their goal.